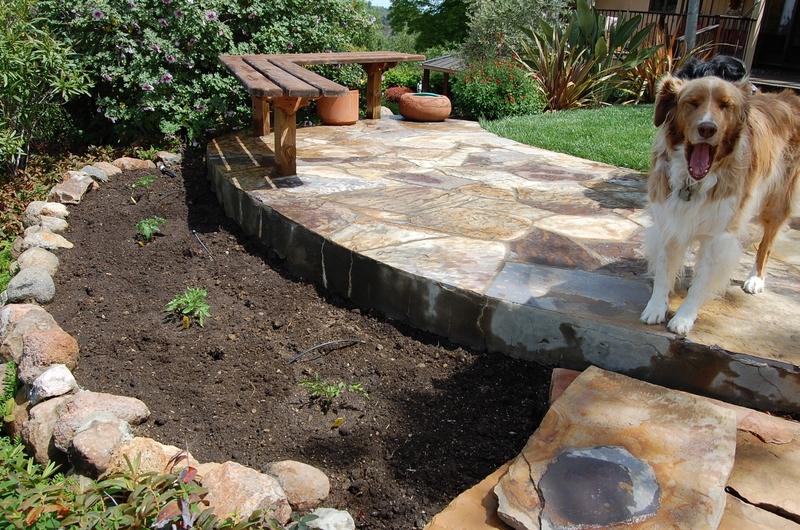 I know, and you know, this Master Gardener blog space is not intended as a garden brag book. However, I am ignoring that caveat today with a bit of boasting about my middle-of-the-yard tomato patch. Don’t know if any of you remember, but back in April I took a leap of faith and sacrificed a smallish, rock-lined area of my yard — normally planted with ornamentals — to the tomato gods. Mind you, this little spot is pretty much in the center of our back yard. I put in just four tomato seedlings, two determinate, two indeterminate. Then I hoped and prayed and the sun shone, and the wind didn’t blow too hard. Update: The tomatoes are thriving, and, despite the goofy cages I’ve placed around them, the plants are lovely. I’ve started harvesting the cherry tomatoes, and a few ‘Beefmasters’. The fruit on the ‘Ace’ and ‘Celebrity’ are starting to blush. This is beyond exciting for me, as I had pretty much given up on getting decent tomatoes from my back yard. 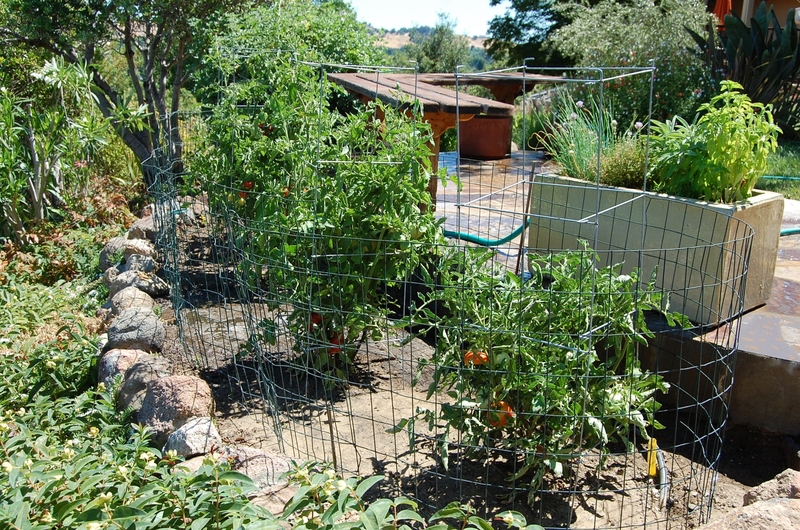 I normally plant tomatoes in our two 10-foot by 4-foot raised beds, which are set away from the house on the southwest side of our property. But the last few years, the tomatoes have not done well. I have over-analyzed why this happened — too hot, too cool, too much water, too little water, planting the wrong varieties for our climate (I am SO over heirlooms!) — and I suspect I’ve hit upon the answer: The soil. This year’s relative and so-far success with tomatoes is probably because I have never before grown tomatoes in this spot. I thought I had been taking good care of the soil in my raised beds. I never planted tomatoes in the same box in consecutive years. 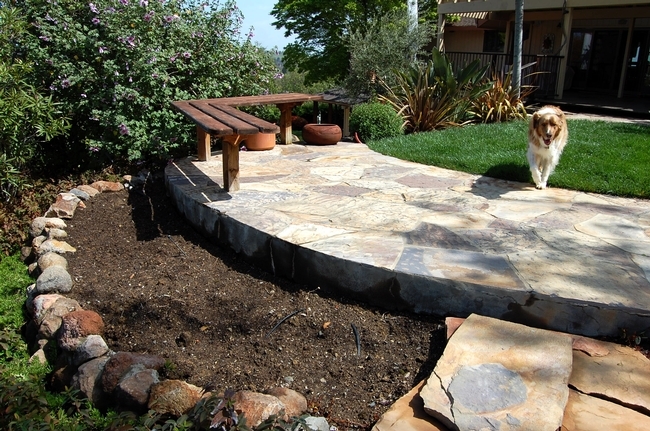 I always added plenty of compost and some organic fertilizer prior to planting. I’ve even grown cover crops (fava beans) over several winters. I’m hoping that by leaving the raised beds fallow for a summer, the soil may recover, at least a little. I’d love some feedback from my fellow Solano gardeners. How do you keep your soil healthy? It ain’t much, but it’s thriving: Four tomatoes smack dab in the middle of the Rico back yard. After a couple of lackluster years in my vegetable garden I have high hopes for this summer’s effort. 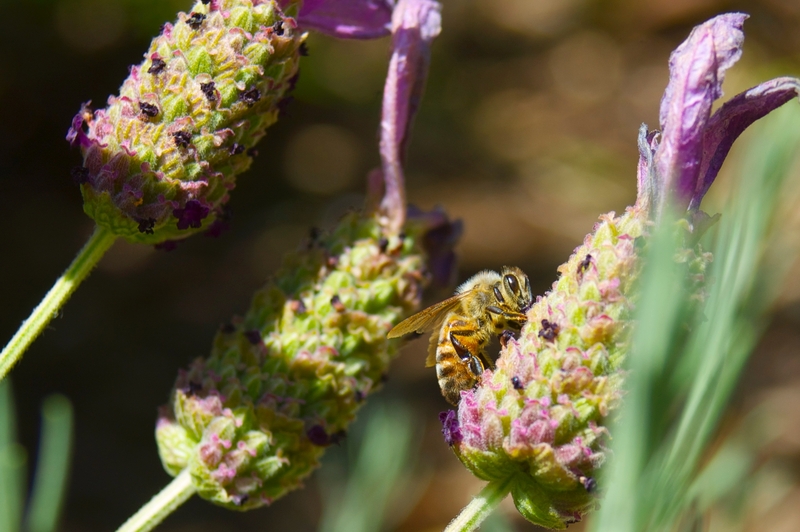 For the first time in far too long, bees are working busily in my garden. The combination of cooler than usual summers the past two years, along with a dwindling bee population has made its mark in my back yard. Tomatoes, zucchini, cantaloupe and beans that grew effortlessly have required hand pollination which has been only marginally successful. Even with that extra effort, the relatively cool temperatures of the past two summers have not spurred the tomatoes into their usual fruiting frenzy. As for the hot summer, it’s more of a double-edged sword. Those cooler summers may not have encouraged vegetables but they sure made the season easier to enjoy. 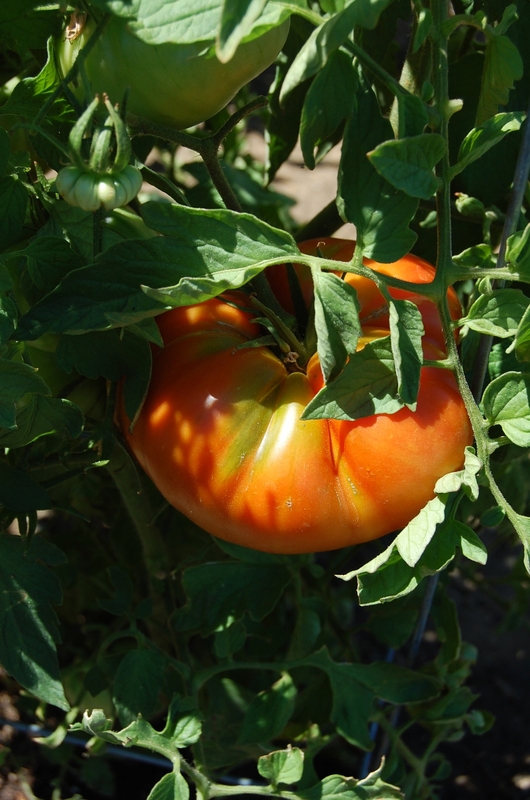 I know we can’t have both, and now while it’s cool, tomatoes have the edge over 100 degree days. You have to be careful what you wish for though, and the outcome probably depends on whether I begin to delight in the vegetables before the heat hits us. I was on a gardening outing last week at a local iris farm, and on my drive home my co-pilot gardener and I had to stop by Morningsun Herb Farm since we were driving right by. What fun, we both love to window shop in spring and pick up a few newbie's to try in our gardens. We found a good assortment of basil, squash, and tomatoes. I chose 'Pruden's Purple' as my tomato experiment this year. I have just found that others have grown this indeterminate variety to a size of 6 to 12 feet tall. My, my. The fruit are about one pound each and are similar to 'Brandywine', another of my favorites. So, I thought maybe I should put up some support now. I just happen to have a number of old trellises in storage. Our side fence finally crashed with a recent wind storm. I salvaged a number of trellises and thought "why not!". 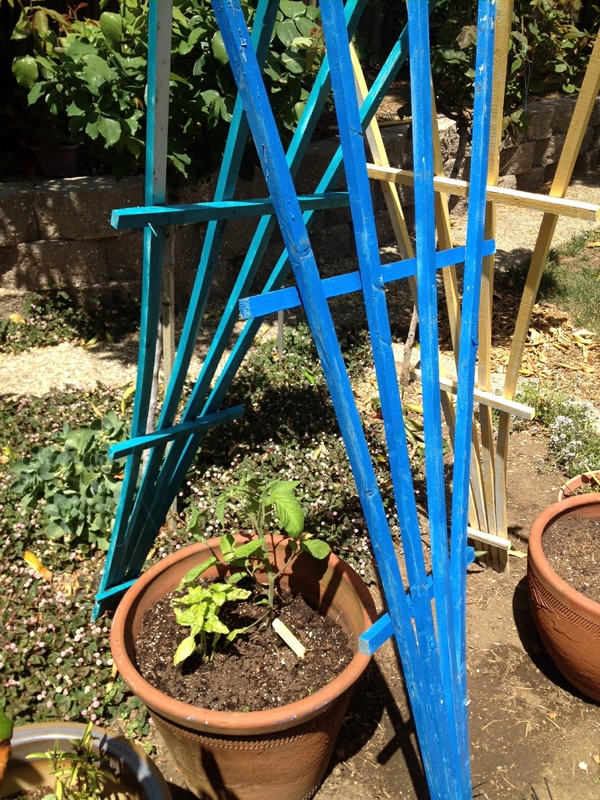 So this morning I pulled out some leftover acrylic paint and have given three trellises a new purpose. So now with the trellises and pots this year for the veg garden, trying to be a little neater this year, well at least I will try. Our wacky spring weather has taught me a lesson, again: I am so NOT in control of anything in nature. In my last blog, I pledged to get my tomato seedlings planted before the self-imposed deadline of April 15. Didn’t happen. I had to wait out the frost warnings and hailstorms that rolled through. Then when rain soaked the soil (which was really very welcome), I had to wait a few more days for it to dry out. But wait I did, and the tomato seedlings are now happily in the soil, soaking up warmth and sunshine, nearly doubling in size after just a week. So patience paid off. I’ll try to remember that next year when tomato-planting season comes around. This made me think of other areas of the yard where patience comes into play. We have three well-established rose bushes, which were planted by the previous owner of our 36-year-old home. 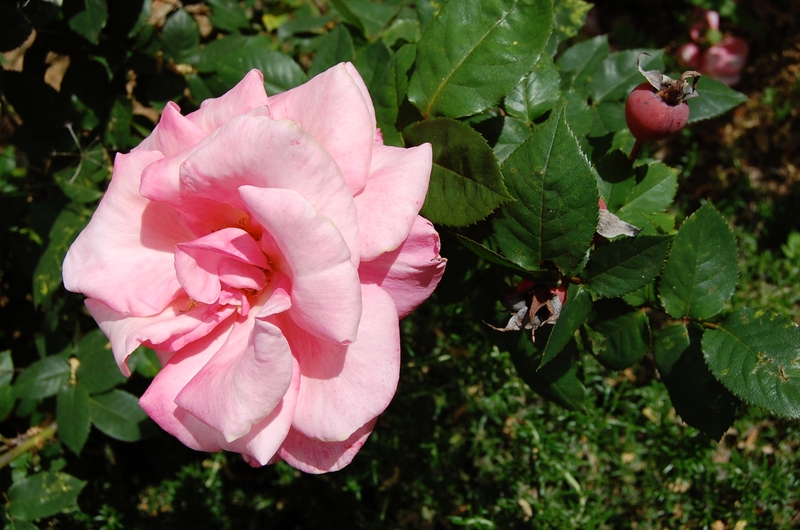 Because I am not a rose fancier (the blossoms are lovely, but the plants are a thorny, unattractive pain, in my opinion), I have steadfastly refused to fuss over these roses. I do not prune them in winter. I do not spray off the aphids in spring. I do not deadhead the fading blossoms. I never, ever fertilize the plants. Mind you, I am not trying to kill them. I simply do not have any patience for the problems they bring. You know what? Those darned roses thrive, putting on dinner-plate-sized blossoms all spring and deep-orange rosehips the rest of the year. In that sense, having no patience (call it laziness or benign neglect) has its benefits. But, lesson learned: Mother Nature is driving this bus, not me. Guess I’d better buckle up and enjoy the ride. An utter lack of patience for rose care does not stop these plants from thriving. Who’s in control here? Like a siren’s song, the tomatoes are calling to me. Blame it on the moist soil, the longer days, and the need to plant something new and productive. And it’s gonna happen soon, the planting of the tomatoes. The threat of frost still hovers over Zone 9, but I know I will throw caution to the wind and plant before April 15. But, this year, I will not plant our tomatoes in the raised beds tucked into the southwest corner of our lot. This year, I will slip those beautiful little seedlings into a stone-lined bed right smack in the middle of our back yard. Yep, right next to the tiny lawn and the salvia (S. microphylla 'Hot Lips') and the creeping myoporum (M. parvifolium 'Putah Creek'). Call me a rebel. I’m going to plant edibles amongst the bloomers. Heck, I might sneak in some bell peppers amongst the penstemon, some basil next to the lavender. I could get used to growing food in the beds that normally grow just pretty flowers. It seems like a much more efficient use of rich, sun-drenched soil, and the irrigation is already there. Who knows? Today I take over a smallish planting bed. Tomorrow it may be the area where our lawn now grows. I’ll keep you posted on the “revolution” taking place in my back yard.